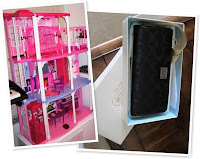 My 'valentino' got me the Barbie doll house...toink! LOL...of course I'm kidding. He got me the wallet which was supposed to be a surprise. It was busted because I'm the one that does the money stuff around here [balancing the check book, etc] and something showed in the account that I didn't know about so I asked. He just said: SURPRISE! Haha! Anyway, he really wants me to get that wallet to match the purse he got me for Christmas...but I wouldn't budge so he waited for a 'reason'...in this case Valentine's Day and got it as present for me. That way I wouldn't say it's too expensive....I still did. That's one thing about my husband...he doesnt push me if I don't want to do something. He finds other ways....LOL. Still, I'm grateful for my present which is now comfortably nestled in the purse he got me for Christmas which I posted here. 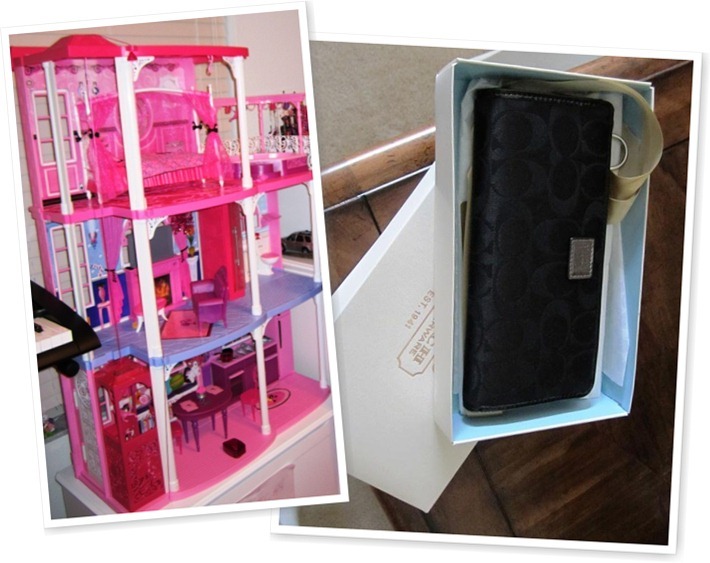 The 'Barbie Doll House' is obviously the little one's. She got a Barbie doll last Christmas and she's been creating a makeshift house for her. She even came up with a 'black print' for a house for her and asked Dad to get her some woods to build the mini-house. We got the hint loud and clear. Being the Daddy's girl that she is...the Dad heard her LOUDER and got her the doll house. We gave it to her as a Valentine's Day present just because...toink! Barbie aka 'Minnie Me' also got a Vday present [aside from the house]....a playmate...KEN! Now everyone's happy. Ha! As for our gift for Dad...nada! Well, a card...which is what we normally get him anyway. Romantic me, eh? Oh wow! What a nice V-gift! How sweet of M! At talagang kasali si young lady sa Valentine gift giving huh?! Naku, dito hindi na ako nag-e-expect. I wonder if I'd even be invited to go out like before. Okay lang din kung hindi. We're not young anymore anyway! hehe..
Malamig pa rin ba dyan? Hope you have a fantastic day!